William Shakespeare’s Birthday May Be Today! William Shakespeare’s birthday may be today! Experts believe he was born in Stratford-on-Avon, England, in 1564, and died in Stratford-on-Avon, England, on April 23, 1616. He is one of the most famous poets and playwrights. His works are among the most quoted in the World. He wrote almost forty plays and over 150 sonnets. 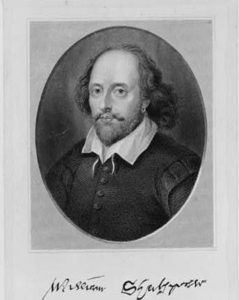 Famous works include Romeo and Juliet and Macbeth. Children can read many of his works at: Project Gutenberg. Boston Latin School opened its doors in 1635, making it the first public school to operate in the colonies. The school continues to exist! Zoetrope was patented by William Lincoln in 1867. He received Patent Number 64,117. A zoetrope produces the illusion of a moving picture by creating two cylinders, one inside the other. The outer cylinder contains paintings. The inner cylinder has slits in its side. When the inner cylinder turns, observers see the images on the outer cylinder move. Quite popular in the 1880’s, zoetropes have found new homes in long subway station platforms. Children could see an amazing Pixar video of a zoetrope at: Zoetrope. Saint George Feast Day remembers the death of the English martyr Saint George in the year 303. He killed the famous dragon that required daily sacrifice. The story of St. George and the Dragon was been written by several different authors. One excellent version is Saint George and the Dragon, written by Margaret Hodges and illustrated by Trina Schart Hyman. The book received the 1985 Caldecott Medal. Top quark was discovered in 1994. This was the last of the six subatomic particles to be found. The other quarks are the bottom quark, strange quark, charm quark, up quark, and down quark. Combinations of these quarks form protons and neutrons. Children could learn more at: Quarks. Shirley Temple Black (born Santa Monica, California, 1928; died Woodside, California, February 10, 2014) starred in approximately 40 movies as a child and served as an ambassador as an adult. Two of her movies were Little Miss Marker and The Little Colonel. 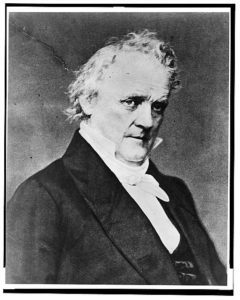 James Buchanan (born Cove Gap, Pennsylvania, 1791; died Lancaster, Pennsylvania, June 1, 1868) was the fifteenth president (1857-1861) of the United States. He was America’s only unmarried president, and he was the only president born in Pennsylvania. Children could visit the White House website at: James Buchanan. Sergei Sergeyevich Prokofiev (born Sontsovka, Ukraine, 1891; died Moscow, Russia, March 5, 1953) was a famous pianist and composer. In 1934 Prokofiev composed the famous symphony Peter and the Wolf. William Williams (born Lebanon, Connecticut, 1731; died Lebanon, Connecticut, August 2, 1811) signed the Declaration of Independence. He represented Connecticut. 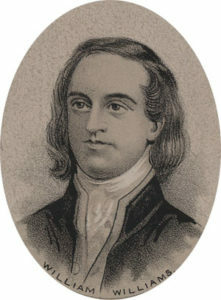 Oliver Wolcott was a Connecticut representative, and he voted for independence. Wolcott had to return to Connecticut, so William Williams took his place and signed the Declaration. A merchant, he became active in Connecticut politics. He was town clerk for 44 years, town leader for 27 years, a member of the Connecticut Lower House for 20 years, a member of the Connecticut Upper House for 23 years, and judge for 35 years. He held several of these offices at the same time. He died exactly 35 years to the day that he signed the Declaration. Granville T. Woods (born Columbus, Ohio, 1856; died New York, New York, January 30, 1910) invented the Synchronous Multiplex Railway Telegraph, making possible communication between dispatchers and moving trains. This invention saved many lives. He held patents for many other inventions, including the trolley car.